Your scissors should always feel comfortable in your hand that way you'll minimise hand fatigue and the chance of developing RSI or carpal tunnel syndrome. Many hair stylists have several pairs of scissors for doing different kinds of hair cutting job. If you're new to hairdressing or barbering, don't spend lots of money on your first scissors as you'll want to upgrade them fairly quickly as your style and skill develop. What size hair scissors will suit me? Some stylists prefer short scissors, others prefer long. To some extent it depends on the type of cutting that you're doing. The length of a scissor is measured from the very tip of the blade to the end of the longest finger hole. It doesn't include the finger rest. To find your ideal size, place a pair of scissors on the palm of your hand with the finger hole touching the base of your thumb, the tip of the blade should be in the last section of your middle finger. What type of blade is best for hair cutting? Broadly speaking there are two types of hair cutting scissor blade: bevelled edge or convex. Which you choose depends on where you are in your career, personal preference and what you can afford. Bevelled-edge blades are made from a mixture of metals which makes them lightweight. Most European scissors use this design often with micro serrations on one or both blades, like the Tondeo T-Chiro. Micro-serrated blades are great when you're learning to cut hair as they stop the hair sliding down the blade. They're also good for slow detail cutting or use on dry hair, but they cannot be used for slice cutting as the hair will jam on the blade. Polished bevelled-edge blades, like those on the Kobe Classic 22, are the ones to use for slicing and can also be used for virtually all other cutting techniques. Often referred to as "Japanese Style", convex blades are the sharpest type of blade with a razor-like edge. 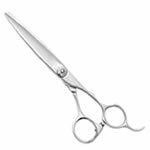 All convex-edged scissors are hollow ground on the inside of the blade which gives a very smooth cutting action. They can be used for all cutting techniques but are especially good for slicing because of the ultra-sharp edge. They are best suited to more experienced hairdressers. Convex blades are made from solid stainless steel which means the blades are a little heavier than bevelled-edge ones. The manufacturing process is similar to that used to make Samurai swords and because it is a long and skilled process, convex-bladed scissors are usually more expensive than bevelled-edge ones. They also require specialist sharpening, but with proper care and regular servicing a pair of convex-bladed scissors will last a lifetime. Some good examples can be found in the Passion Scissors and Kasho Scissors ranges. What type of scissor handle is best? Level or Even handle—the basic design, the handles are symmetrical and look quite straight. Good examples of this are the Tondeo Slicy Classic or the Jaguar Pre Style Ergo. Offset handle—one handle is longer than the other which allows a more open hand position and for the arm and elbow to be in a lower position when cutting which is generally more comfortable. Good examples are the TRI Colorline Offset or the Jay² Scissors range. Crane handle—similar to the offset although the top handle is very straight. Once again this allows a lower elbow position. A good example is the Bonika Silk Crane. More advanced handle designs are also available like the twister (such as the Bonika International Twister or the Matsuzaki MWQ) or flex (such as the Jaguar Finesse Flex) styles, where your entire hand can rotate. These can dramatically reduce hand and arm fatigue. Many left-handed stylists start their careers with right-handed scissors and being told "you'll get used to it", which by and large they do. However, the reversed blades in left-handed scissors make the cutting more natural and mean left handers don't have to use extra force which helps prevent hand and wrist pain. We always recommend using the correct scissor configuration for your dominant hand. However, if you're left handed and have been using a right handed scissor, it can be hard to change. If this sounds like you, then we'd be happy to offer free, no-obligation advice on what to expect and how to overcome the odd feeling with your new scissors. Just call 01253 893091. Do I need cobalt or molybdenum scissors? Many high-end scissors have blades made from steel that has been improved by the addition of other substances usually to give it greater strength. The handles are usually still made from a softer steel. Cobalt is such an additive, while molybdenum as well as increasing the strength of the metal also adds flexibility. A cobalt scissor, like the Ama Black Knight Cobalt or those in the Passion Scissors range, should remain sharper for longer if looked after correctly. What sort of screw system is best? You can check the correct scissor tension by fully opening your scissors and then allowing one blade to drop freely towards fully closed. When the tension is correct, it should stop smoothly at the ten-to-the-hour position. How often will my scissors need sharpening? This depends entirely on how much they are used, what type of cutting you do, how you look after them and what type of blade you are using. Basically all scissors should be serviced at least every year although many people have theirs checked over every 3-6 months. Be very careful who sharpens your scissors. You need special training and specialist equipment to sharpen convex blades. Many sharpeners have neither and you could end up with scissors that are very different to their original state. Which scissors should I use for slicing? Convex blades are the ultimate and sharpest for slicing, some better quality bevelled edge scissors can also be used. Remember the better the quality the easier slicing and chipping in will become. Do I need thinning scissors? Yes. Although you won't use thinning scissors on every haircut they're a vital part of your tool kit. If you're new to hairdressing, an average thinner like the Ama Contour or the Glamtech Zebra will be all you need. A texturiser is a thinner that not only thins out the hair but adds a finish to the design whilst cutting. There are many different types of thinner on the market, a basic thinner will remove a percentage of the hair but unless used creatively will not produce a significant style. 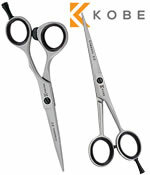 A texturiser like the Bonika T15 or the Kobe K14 does the thinning and will also create a great style if used well. What routine maintenance should I do? Hairdressing and barber scissors are precision tools and need regular cleaning and oiling, every day if possible. Don't use clipper oil to lubricate them but a proper mineral-based scissor oil and keep them in a leather pouch if possible.